It’s been a very busy few months indeed! Firstly, I have had an exciting and time-filled time doing my Being Dorothy project, in which I have dressed as Dorothy Wordsworth, walked Dorothy’s walks and read her journals to see how this would influence my practice. Being Dorothy, was part of This Girl Did – an exhibition put on by The Wordsworth Trust, and co-curated with Dr Jo Taylor about Dorothy Wordsworth and women mountaineers. A high point was ascending Scafell Pike, in costume 200 years to the day that Dorothy and her friend Mary Barker (role taken by writer Harriet Fraser), together with a “trusted maid Agnes” (Dr Jo Taylor of Manchester University), a shepherd (Paul Westover of Brigham Young University) and an un-named porter (Dr Paul Davies), did the same on October 7th 2018. it was quite an adventure, and you can find out all about it in the film (see below) that was made of the event, which premiered at the Kendal Mountain Festival. Several paintings have been produced as a result of that day. At time of writing, the exhibition is a finalist in the Cumbria Life Culture Awards, which we are all tremendously thrilled about! Another has been accepted at the Mall Galleries as part of the 120th exhibition of the Pastel Society [here]. This painting has now sold, but is still on exhibition until Feb 23rd. “Being Dorothy” has set me off on a long term creative project, one I call JourneyWoman, there is further information about this on my website www.journeywomanproject.co.uk in which I am following a creative path that is a voyage of discovery, stimulated by the writings and practice of Dorothy Wordsworth. One 23rd Feb three of us reprised our roles as Dorothy Wordsworth, her friend Mary Barker and ‘trusted maid Agnes” and went for a ramble back up Scafell in the most amazingly sunny but snowy weather with Clare Balding for her Ramblings programme on Radio 4. It will be aired as the third edition in the series, which will be broadcast on Thursday 28th Feb at 15.02 and again the following Sat at 06.07. Each workshop is still at 2017 prices, so £75 per day, inclusive of Janet’s amazing food. I have also started a longer course called Drawing for Mindfulness, at Mostyn Hall in Penrith, where Blue Jam Arts are based. This is for anyone who would like to draw, have some time out and learn some drawing techniques as well. You can join at anytime. It is with great pleasure that I can announce that the “Not Foundation” course as we call it (research suggested that a course has to lead to Higher Education before we can officially call it that, so it’s actually Foundations in Art) begins on Thursday Feb 7th. It will last for a full year, with the next course starting in 2020. It is divided into eight three-day modules over 12 months, with home study and plenty of online support in between. Modules can be taken separately, further details will be posted shortly., or please make contact if you want to know more. I am having my barn converted into a living space/studio and will be pleased to offer short summer schools, starting in 2020. I will be running one school myself, and also inviting experienced and established artists to deliver three and four day courses from “Reivers Barn”, near Appleby and Penrith, in the wonderful landscape of the North Pennines. Places are likely to go quickly and we are limiting the course numbers to a maximum of 8. Full lunch and refreshments will be included, prices are likely to be around £350 per course. IF the barn is finished by this summer (the builders are racing ahead! ), then I may be able to offer a taster course at the end of the summer for a smaller number at a reduced price. Please let me know if you would be interested. Very much enjoyed reading your post and I would be interested in attending a workshop at your new centre. 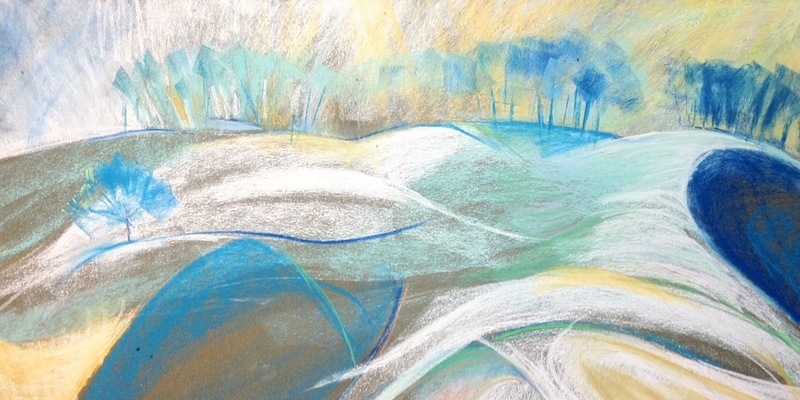 I’m mostly interested in working in pastels but also mixed media.